It's no surprise that the mirrorless interchangeable lens camera category is continuing to grow at a rapid pace. These compact, pro-featured ILCs undoubtedly have a strong future, with mass consumer appeal and a widening assortment of price points. We're particularly taken with the technology's compact footprint -- we're focusing our camera reviews on mirrorless models, and even outfitted our entire CES team with Sony's NEX-C3. But long before the likes of Sony and Fujifilm launched their first cameras, Olympus and Panasonic dominated the then-infant mirrorless category, developing the Micro Four Thirds sensor standard, that, for better or worse, has failed to catch on among other manufacturers. Surprisingly, Panasonic's pioneering days were far stronger than those of recent past, with the company's GF1 melting the hearts of compact-seeking professionals. But following that successful first model, Panasonic opted to take the GF series in a different direction, launching a dumbed-down GF2 (and later GF3) in what was likely an attempt to appeal to the much larger amateur category. This left the GF1 faithful without a worthy successor -- until now. The Panasonic Lumix DMC-GX1 looks pretty standard on paper: there's a 16-megapixel Live MOS sensor, a choice of body colors, RAW shooting, HD video and a top sensitivity of ISO 12,800. 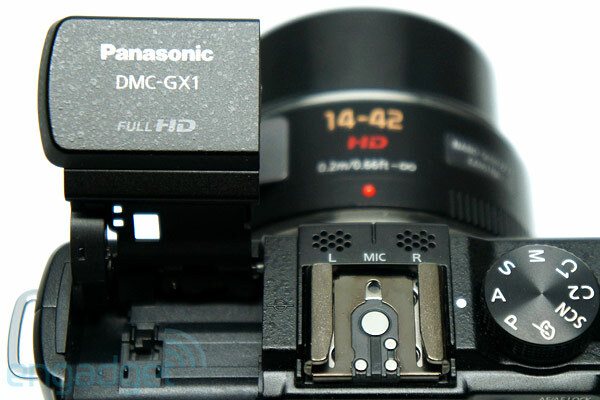 Just as it did with the GF2 and GF3 body designs, Panasonic took a different direction with its new X-series lenses, swapping the traditional manual zoom for a motorized version, enabling a much more compact footprint. The difference when positioned alongside the NEX-C3's 18-55mm zoom is staggering, but Panasonic didn't arrive at this slick design without compromise, particularly noticeable when it comes time to swallow the $950 kit price. Still, one look at the hardened matte black metal body is all it takes to know that this is no GF4 -- this is it, the long-awaited successor to the GF1 has finally arrived. So, will the GX1 be our new top pick for the mirrorless category? Join us past the break to find out. 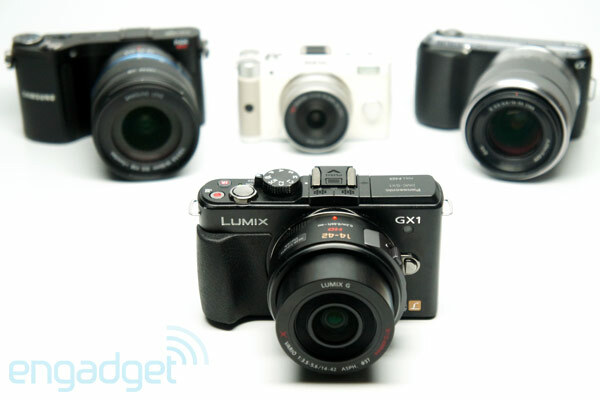 With the GX1, Panasonic's acclaimed GF1 finally has a worthy successor. 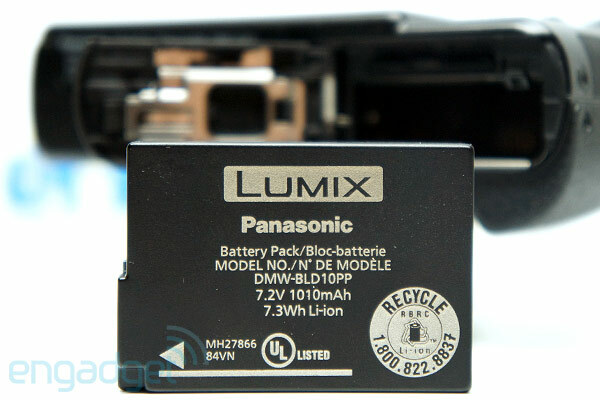 How would you rate the LUMIX DMC-GX1? Canopied in varying shades of matte black paint, the GX1 has a sleek and elegant retro design. Panasonic didn't exactly take many risks when it came to the camera's physical appearance compared to the GF1, but if we have any complaints about that model, design doesn't come to mind. The GX1's metal construction makes it heavy enough to feel solidly built, but it's still light enough to be worn comfortably around your neck. This should of course come as no surprise to GF1 vets, but the GX1 is far too large to fit in your pocket. Still, the control layout and instrument placement is very efficient, albeit a bit cluttered, so there's very little wasted space. While it's certainly an upgrade, Panasonic didn't intend the GX1 to replace the GF3 -- the company's more, shall we say, beginner-friendly model, from both a price and design standpoint. The GX1 marks the return of the full-size hot shoe, however, which made its way from the GF1 to the GF2, but was notably absent on the GF3. The hot shoe doubles as a base for the new 1.440k-dot LVF2 electronic viewfinder, which can be added to the kit for an additional $250. 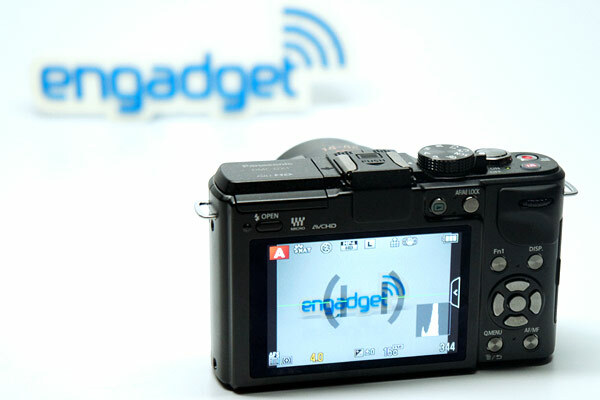 That accessory is powered by a proprietary connector, positioned directly below the hot shoe. And there's also a stereo mic on the opposite side of the shoe, with clearly defined left and right positions. Still up top and to the right of the hot shoe, you'll find a dedicated mode dial, with positions for aperture- and shutter-priority, program mode, manual, two custom modes, a scene mode with access to 17 programmed shooting modes and a Creative Control mode with a handful of artistic settings that we'll expand on a bit further below. There's no auto mode on the main dial itself -- instead, you can launch Intelligent Auto by tapping a dedicated button to the right of the dial, with the button glowing blue when activated. There's a power lever to the right that, just like the mode dial, takes just enough force to turn that you need not worry about accidentally activating it while recording. There's also a dedicated still shutter release along with a video record button. Notably absent, however, is a zoom slider, which you'll instead find mounted to the left side of the lens. Speaking of those lenses, the GX1 doesn't ship with one at that $700 sticker price. Instead, you can purchase either the new Lumix G X Vario PZ 14-42mm f/3.5-5.6 ASPH Power OIS lens for $400, or a Lumix G 14-42mm f/3.5-5.6 Mega OIS optic wish a $200 list price (or you can opt for a kit that includes the X lens for $950). Both lenses offer a 28-84mm 35mm equivalent focal length, but the former (and pricier) version includes electric-powered zoom functionality, enabling smoother zooming during video capture and an overall (much) more compact design. We tried out the GX1 paired with the new X-series lens, which performed very well during our week-long test period, offering excellent focus speeds and smooth zoom. Advanced photographers may not be so keen on the lack of manual zoom and focus ring control, but the size tradeoff is worthwhile for most. Continuing the tour, the majority of the GX1's backside is occupied by a 460k-dot 3-inch LCD. Unlike the GF1, this successor's display includes touch functionality, though you certainly don't need to use it -- the touchscreen interface enables you to zoom, touch-to-focus and even fire the shutter without using physical controls, though dedicated buttons are available as well (with the notable exception of touch-to-focus). The display is acceptably sharp and responsive, and there's a nifty level gauge on screen to help ensure the correct horizontal and vertical position. There's also an on-screen histogram option, which you can position anywhere you'd like just by tapping and dragging it on the screen. The LCD occasionally displayed the image preview with incorrect color balance, though the captured image was typically accurate, even when it didn't match the preview. To the right side of the display, you'll find a playback button, AF/AE lock, along with function, display, quick menu and AF/MF buttons. 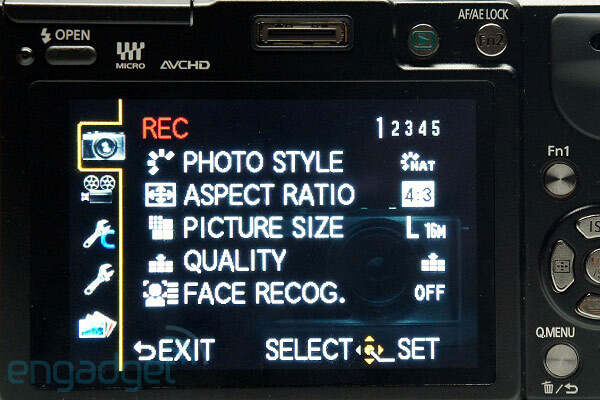 A five-position selector also brings direct access to ISO, white balance, shooting speed, focus area and menu controls. 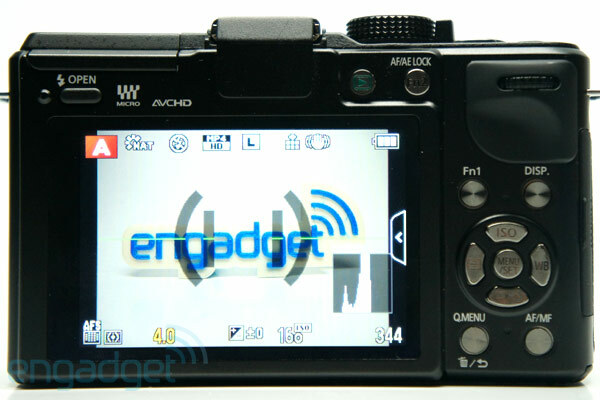 Finally, there's a flash release button just above the LCD -- pushing it activates the pop-up flash, which extends above either lens but can also be used in a variety of manually-controlled positions. On the right side of the camera, there's a remote connector, an HDMI port along with a proprietary PC/AV connector. The bottom includes a metal tripod connector and a battery cover that slides to reveal a SD card slot and a 1,010mAh rechargeable battery. A far cry from the GF2 and GF3, the GX1 offers generally excellent performance from a shooting perspective, with an interface and control layout that will feel quite familiar to GF1 owners. The camera can power on and fire its first image in just 1.4 seconds, including the time required to focus. Once it's powered on, it can change focus from a far subject to one that's near and capture an image in less than a half second after pressing the shutter release -- if you're capturing another image after focusing, the delay is virtually unnoticeable, with the camera firing instantaneously. Even low-light subjects come into focus in a small fraction of a second, resulting in a very pleasant shooting experience, regardless of condition. This incredibly fast focus time made shooting moving subjects not only possible, but even enjoyable -- we noticed a unicyclist riding down the sidewalk just a moment before he passed directly in front of the lens, yet the camera was able to capture him with sharp focus, as if we had time to prepare composition. This rarely tends to be an issue with full-size DSLRs, but mirrorless cameras (and especially point-and-shoots) rarely offer this level of performance. We also had a positive experience shooting 720p video, thanks to the GX1's accurate focus and exposure. (The camera is also capable of 1080/60i capture.) We noticed a delay when rapidly switching between near and far subjects during video capture, as you can see in the clip below, but Panasonic may have opted for a more gradual adjustment to avoid dramatic shifts and unintended focus hunting, which is an issue on other cameras -- even the beloved Sony NEX-C3. Since you're very unlikely to jump back and forth between subjects near to the camera and those in the distance while capturing a single clip, this shouldn't be an issue for you. The camera's 1,010mAh battery, while not particularly generous in size, was perfectly sufficient over our nearly week-long test period. We were able to capture 530 photos and 12 minutes of video in a variety of conditions, including low light and a few shots with flash. Speaking of the flash, there's a compact model built-in, but it didn't perform very well during our test, blowing out details even when shooting in Intelligent Auto mode. We spent a significant amount of time reviewing images and adjusting settings on the LCD, which contributes to power draw as well. The battery is incredibly lightweight, which matters less on a camera of this size than it does on a compact point and shoot, but we're happy to reduce weight wherever possible. The GX1's image quality is definitely an improvement over the GF3, which suffered from significant noise in low-light shooting and had an awfully difficult time white balancing during our brief indoor test period. As with any camera, the GX1 performed at its best when shooting outdoors in bright light, where focus, exposure and white balance were typically spot-on. Bright light shooting also allows for low image sensitivity, and noise was undetectable in any of these outdoor images, even at a 100 percent view. 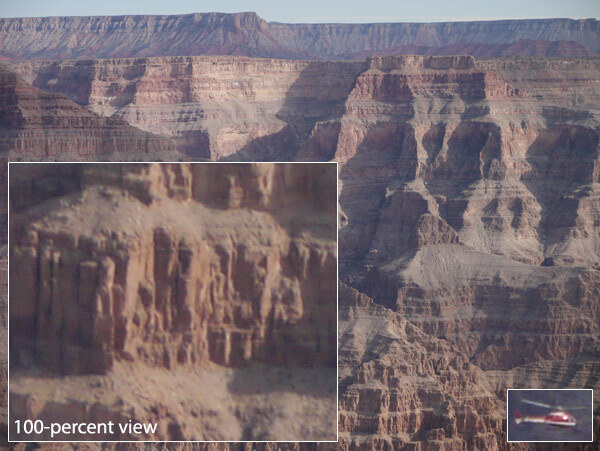 Details often didn't appear tack-sharp at a 1:1 pixel view and some scenes were occasionally flat, as you can see in the image below, but overall image quality was quite good for a Micro Four Thirds camera. As you've probably noticed, the GX1 offers an image sensitivity of ISO 160 - 12,800, making it theoretically capable of competing with the big guys, at least when it comes to low-light shooting. But it's one thing to claim that a camera can capture usable images at high ISOs -- actually delivering on that promise has traditionally been a challenge. As expected, especially given the sensor size, images were very noisy at 12,800, even when scaled down to 600 pixels wide (the size we use on the web). There was a staggering improvement at ISO 6400, however, with the camera capturing usable photos at any size, though noise was clearly visible at a 100 percent view. Image quality was excellent once we dropped to ISO 3200 and below -- at that sensitivity noise was visible at 100-percent view, but we would be comfortable leaving the ISO fixed at that setting for everyday straight-to-web shooting. 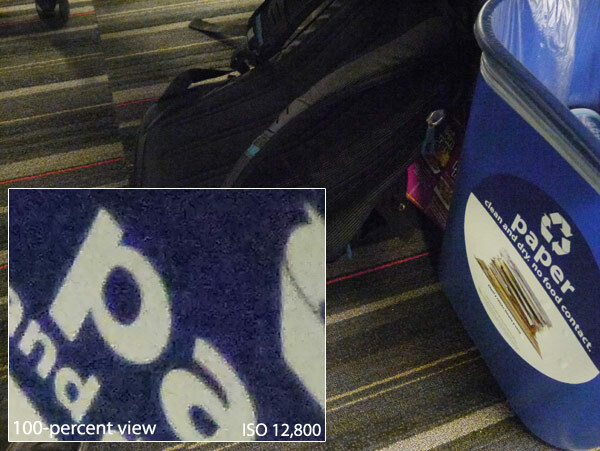 Noise became barely perceptible at ISO 1600, and was hardly noticeable at all at ISO 800 and below. For the most part, the GX1's user interface is intuitive enough that you can just pick up the camera and start shooting without flipping through the manual. More advanced adjustments, like changing exposure compensation (push in the rear control wheel) and moving the histogram (click and drag it using your finder) probably require an hour or two with that little black and white book that advanced photographers tend to set aside, or never unwrap. Once you've got the hang of it, however, the user interface is incredibly easy to maneuver, with logical button and settings placement. In addition to the buttons that we outlined along with the rest of the hardware above, there's also a slide-out touchscreen drawer with options to control zoom, activate screen-tap shutter release, enable/disable the on-screen position guide and activate/move the histogram. You'll probably be more comfortable using hardware controls for most of these functions, so it's convenient that the drawer can be tucked away out of view. The camera includes a fairly comprehensive display overlay, with readouts of all critical settings at the top and bottom of the frame. Unfortunately there's no battery percentage meter -- instead, you're left with a standard three-level indicator. The camera (almost) makes up for that with the inclusion of a precise focal length readout, along with a nifty countdown for long (one-second-and-up) exposures. Often-used settings like metering mode, flash, picture and movie recording size and quality, histogram, guide lines and photo style are accessible by tapping the Q Menu button. Other adjustments may require a trip to the main system menu, which you can access using a dedicated menu button in the center of the five-position controller. Menu items are presented on five multi-page tabs, including Record, Motion Picture, Custom, Setup and Playback. Some of these sub-menus are many pages deep (seven for the Custom menu, for example), though intuitive placement makes it fairly easy to find the setting you're looking for. When push comes to shove, Sony's NEX-C3 still remains the one and only steal, at $550 including an 18-55mm lens. Until now, we've spent little time focusing on price, since the GX1 is powerful enough to justify that $699 body-only sticker. But once you factor in the lens (even at the $950 kit price), you're getting dangerously close to mid-range DSLR territory. Still, this is really the first mirrorless camera we've come across that offers an overall package that rivals the NEX-C3, which has been our top pick in the category from a cost:benefit perspective. From a strict value standpoint, the Sony cam still offers the most bang for your buck, especially when you consider that you can get a body and lens for $150 less than the GX1 alone. If you're looking for a camera with similar focusing performance and a Micro Four Thirds sensor and mount, then Olympus's E-P3 is another excellent choice. It also offers a retractable lens, but with a manual twist-zoom function. And you can take home the kit (with 14-42mm zoom lens) for $900 -- 50 bucks less than the GX1. When push comes to shove, Sony's NEX-C3 still remains the one and only steal, at $550 including an 18-55mm lens, a larger APS-C sensor and a slightly smaller form factor, lenses not withstanding. 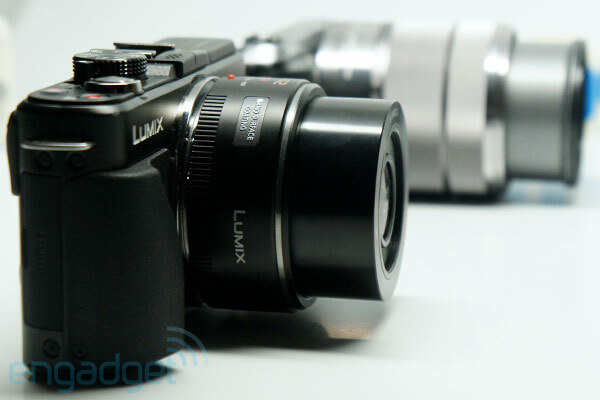 All things considered, we're quite thrilled with the Panasonic Lumix DMC-GX1. Micro Four Thirds early adopters who fell for the GF1's sleek, retro design two years ago finally have a successor worth considering, and we may even go so far as to say that Panasonic has undone the wrong caused by the misdirected marketing strategy adopted by the GF2 and GF3. The GX1 is, in fact, a terrific shooter, exceeding our expectations and giving us the first viable alternative to the stellar Sony NEX-C3. If you have deep pockets and a desire to continue your love affair with the GF-series that never was, look no further than the GX1.